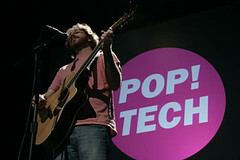 Pop!Tech bard, Jonathan Coulton, combines the sweetest of melodies with bizarrely captivating lyrics inspired by random photos downloaded from Flickr. Watch the video of Coulton's "Flickr" music video to make sense of these wackaddodle images. Stick with it as the song slowly slips from sickly sweet into subversively surreal.